Welcome to our church, where we take to heart Christ’s call to love and serve! Ours is a warm and welcoming church. We seek to follow the path of Christ in honoring all people. We embrace the peace of God entrusted to us in Christ, and hear the call to act to make real in our world Christ’s call for healing, reconciliation, renewal- new life in Christ! We treasure people of every age, and aspire to extend our love and service to children, youth, and adults of every generation. You are welcome to worship with us and to serve, sing, play, laugh and work with us! You might find us putting on a free public supper, raising funds for our local Food Pantry or Heating Fund, canoeing the waters of Northern Maine, taking a hike in the Western Mountains, or serving a mission in Honduras in Central America! We take our responsibility to our neighbors seriously, and when someone is in need, we are there in a heartbeat. As a “congregational” church, “We are the church.” Nearly 50% of our membership serves on one of our committee ministries or in the choir! In recent years we have sought to be a very good neighbor in the community, and have sponsored community concerts, community breakfasts with speakers addressing various topics on the well-being of the community. We join with other churches to offer special services and programs, including Easter sunrise, a summer ecumenical worship on the weekend of the Wilton Blueberry Festival, a Christmas concert, the Food Pantry, and free public suppers. In worship you will be greeted personally at every service! You will find times for silence, times for singing, and times to pray for ourselves, our neighbors near and far, our world, and for joys and concerns of every kind that arise from our congregation. Every Sunday, year-round, there is a special children’s sermon “Time for the Young at Heart” where it is not unusual to find a few adults sitting in! 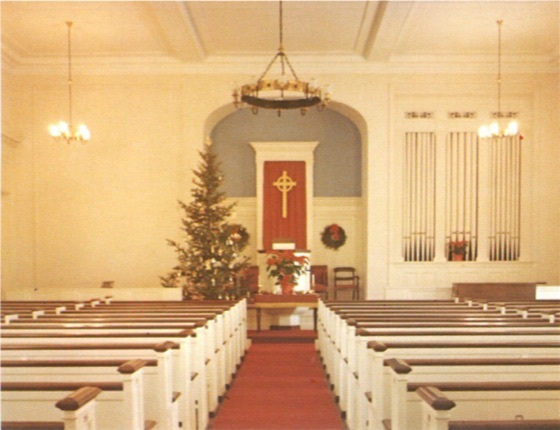 Our sermons may be delivered from the classic pulpit in our beautiful old New England style sanctuary, but you may visit on a day when the sermon is in the form of a drama, or discussion with the congregation, or even involve the youth of the church sharing their wisdom with the church at large. We have a beautiful pipe organ that dates from the 1930’s, but on any given Sunday we may also have the music of the youth of our church either in voice or on instruments of many kinds. At the heart of all that we do our reason for being is to be a called community where we celebrate God’s glory and God’s presence in our lives and the life of the world. That we may all draw ever closer to God, and that faith, hope, and love may dwell and endure – to this we aspire.